It wasn't a save situation, but it was definitely the spot in the game where the home teams uses its closer, because at that stage of the game, the home team can't have a lead without the game ending, so there's no longer a chance for a save situation. Tie score, top of the ninth inning, the Phillies used their guy who locked it down for them all of last year...the same guy who has really struggled this season. Brad Lidge entered the game in the ninth inning and quickly retired the first two batters he faced, with the game tied 4-4. Up came Johnny Damon, who battled and drew pitch after pitch, before working a 2 out single. 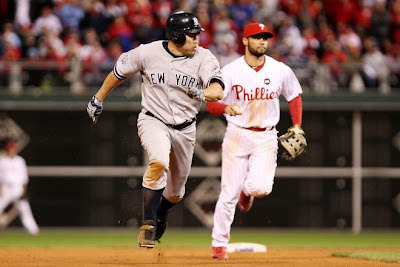 With Mark Teixeira batting, the Phillies shifted their infield toward the right side. Damon stole second, and third baseman Pedro Feliz fielded the throw from catcher Carlos Ruiz at second base. An alert Damon noticed that no Phillie was covering the third base bag that Feliz abandoned when he shifted, so Damon quickly broke for third, stealing TWO bases on the same play. Dipping back to earlier in the game, Alex Rodriguez was hit by a pitch in the 1st inning. After Rodriguez complained, the umpiring crew held a brief conference on the field and motioned to both dugouts to warn against retaliation and further hit batters. The warning meant that any additional hit batters would result in an ejection. And now returning to the ninth inning, with Damon on third base, Mark Teixeira was hit by a pitch. Lidge should have been ejected. Instead, the umpiring crew did nothing, and Lidge stayed in the game to allow three runs on an Alex Rodriguez RBI double and Jorge Posada 2-RBI single. Lidge was rattled after the Damon hit. An ejection would have been a favor from the umpires, based on the events that followed. Mariano Rivera entered with the 3 run lead and threw a scoreless bottom of the 9th for the Yankees. Now, they stand one win away from their 27th World Series Championship. I proclaimed in August that Lidge's role as closer would prevent the Phillies from repeating as World Champions, and right now, after Lidge blew such a pivotal game against the Yankees in the World Series, that statement could turn out to be accurate. Here's an AP article about how the Phillies continue to honor Harry Kalas.